St. John's wort is unique among herbal treatments because it has traditional and modern acceptance for both mental and physical complaints. 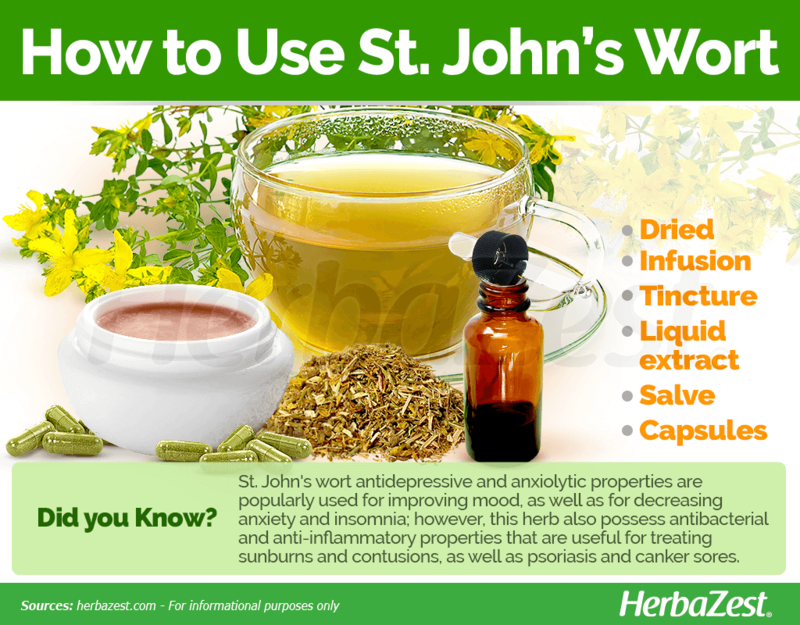 Steeped in mythological mystery alongside its long-held scientific support, Saint John's wort is one of few medicinal herbs that have found mainstream use in treating both mental and physical ailments. Native populations of St. John's wort have been found in many locations, so the exact place of its origin remains unknown. The St. John's wort plant comes from the temperate regions of Europe and Asia and has spread throughout the world in areas with similar climates. Treating depression. One of St. John's wort's primary medicinal properties is its ability to treat minor to moderate depression. Soothing anxiety. Due to its sedative properties, St. John's wort has been used to treat minor to moderate symptoms of anxiety and panic disorder. In addition, St. John's wort properties can help treat the symptoms of obsessive compulsive disorder (OCD) and, when applied topically, it can soothe skin injuries, such as minor burns, sunburns, abrasions, and contusions, as well as dermatological conditions like psoriasis and mild herpes symptoms, such as canker sores. The active ingredients in the herb have been under revision and discussion in the scientific community for years, and current research points to its concentrations of hypericin and hyperforin, compounds that act on mood-regulating messengers in the nervous system. Flavonoids and tannins are also present, which may additionally imbue the herb with antioxidant properties. 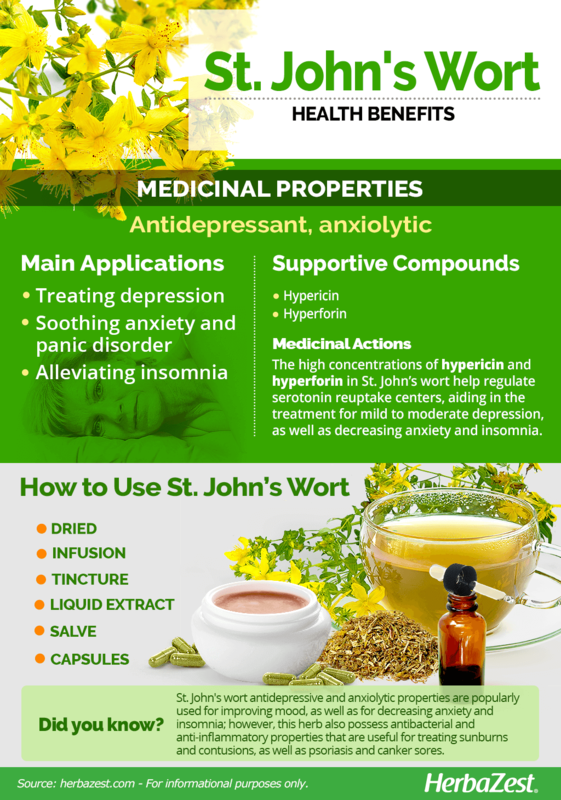 Nowadays, due to the scientifically proven inhibitory action of hypericin and hyperforin on serotonin reuptake, St. John's wort still being used in the treatment of mild to moderate depression, as well as for improving mood and decreasing anxiety and insomnia. Research also supports its use for menopausal women, who often experience fewer symptoms while taking it. HYPERFORIN'S MECHANISM OF ACTION IS SIMILAR TO THAT OF COMMERCIAL ANTIDEPRESSANTS. Other herbs with mildly antidepressant and sedative effects are passion flower, valerian, skullcap, linden, and lemon balm. St. John's wort is likely safe for most people when taken orally in the recommended doses. However, it can cause some minor side effects for some people, such as difficulty sleeping, vivid dreams, restlessness, anxiety, irritability, upset stomach, fatigue, dry mouth, dizziness, headache, skin rash, diarrhea, and tingling extremities. When taken in excess, St. John's wort can also worsen the severity of sunburn for fair-skinned individuals, so wearing sunblock is required when taking St. John's wort medicinally. Individuals who suffer from neurological conditions, such as Alzheimer's disease, attention deficit-hyperactivity disorder (ADHD), bipolar disorder, major depression, and schizophrenia, should consult a physician before taking St. John's wort, since it can worsen these conditions and interact with certain medications. Individuals who will undergo surgery should avoid using St. John's wort, since it can interact with anesthesia. Women who are trying to conceive should not take St. John's wort, since it can hinder fertility. Pregnant or breastfeeding women should consult a physician before taking St. John's wort medicinally, since it can trigger colic, drowsiness, and listlessness for babies who drink breast milk from mothers who take St. John's wort. St. John's wort herb is not often used for culinary purposes. Therefore, the most effective way of obtaining its health benefits is in medicinal forms of consumption, where St. John's wort properties are more concentrated. Dried. The dried leaves of St. Johns wort can be used for preparing a variety of home remedies for soothing the nerves and gently inducing relaxation and sleep, as well as for treating skin conditions. Infusion. When steeped into hot water and consumed as an herbal tea, St. John's wort properties can help treating acute stress and panic disorders, as well as insomnia. Tincture. Diluting few drops of this potent alcohol-based St. John's wort preparation in a glass of water can help treat depression, anxiety, and panic disorder. Liquid extract. 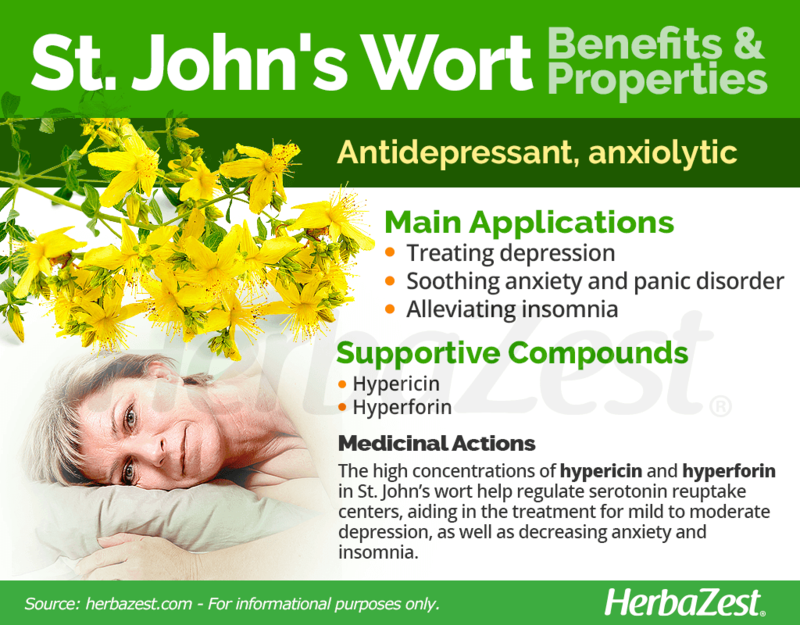 In this concentrated form, St. John's wort properties can be helpful for treating anxiety and insomnia. Salve. 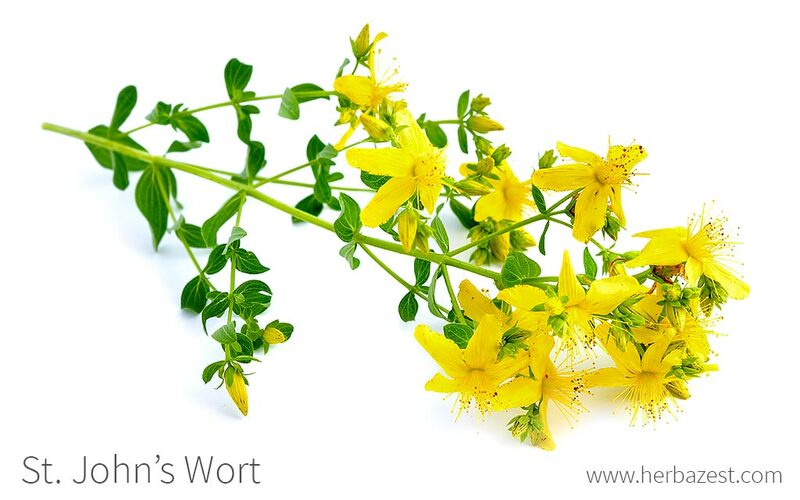 St. John's wort properties have also proven effective for treating dermatological issues. When applied topically as an ointment, St. John's wort can help treat psoriasis and related skin conditions, due to its anti-inflammatory and antimicrobial properties. Capsules. When taken in this supplemental form, St. John's wort can improve depression symptoms, as well as helping manage obsessive compulsive disorder (OCD). The dried leaves of St. Johns wort can be easily purchased, in bulk form or teabags, at most supermarkets, grocery stores, and specialized health stores, as well as through online retailers. As St. John's wort is a well-established herbal remedy, preparations containing it, from tinctures and salves to capsules, are typically available online, as well as in specialized health stores and some pharmacies. The St. John's wort herb prefers temperate climates and thrives best when it is planted in the spring, in a full sun or partial shade spot. The ideal growing temperatures for this plant are within the range of 59 - 68°F (15 - 20°C). St. John's wort should be planted in warm, sandy soils. In poor-quality soils, the St. John's wort plant will need a balanced fertilizer to thrive. The St. John's wort plant is an herbaceous perennial with extensive, creeping rhizomes that grow beneath the surface. Its stems are erect, branched in the upper section, and can grow up to three feet (1 m) tall from its single stem, directly from which grow their characteristically "perforated" narrow, opposing leaves that appear dotted with translucent points when held to the light. Blooms are bright yellow with black dots. St. John's wort (Hypericum perforatum) is a member of the Hypericum genus, which features about 400 species of temperate-climate plants that are sometimes all given the umbrella distinction of St. John's wort, despite various differences in appearance. Since Hypericum perforatum has not been traditionally cultivated on such a large scale, cultivars have not been developed and no true subspecies have been identified. However, many distinct species go by the name of Saint John's wort and all are closely related, within the same genus. Among the mistaken Hypericum species that share this common name, the most notable ones include slender St. John's wort (H. pulchrum), of Western Europe; great St. John's wort (H. calycinum), a taller Mediterranean species; and square-stemmed St. John's wort (H. tetrapterum), also known as Peter's wort, among other species. Since St. John's wort has such a vast native region, is likely that it has been domesticated at several points on different continents. In China, evidence shows that it had been used by humans for at least 2,000 years, while in Western Europe the first records of it use date from 400 BCE to Ancient Greece and Rome. St. John's wort first found human use as a medicinal herb for everything from snake bites to indigestion to depression in classical as well as ancient Chinese culture. As a powerful natural alternative to many medications, St. John's wort is now frequently prescribed as a first line of defense against depression, which affects approximately 350 million people around the world today. Consumer research reflects this statistic: in 2011, the herb was the ninth top-selling herbal supplement in the United States, generating approximately $8.4 million USD from that market alone. Though considered an invasive plant in the country, Australia is also its leading commercial producer, providing 20% of the world's annual supply. Greek and Roman civilizations thought it to prolong life and employed it in religious ceremonies, calling it hypericon in the former, which roughly translates to "among" or "over gods." Christians later associated its late-spring blooms with John the Baptist, born June 24th, and the faith later spread its cultivation to European colonies worldwide. St. John's wort genus name, Hypericum, derives from the Greek words hyper (above) and eikon (icon), meaning "above an icon" or "over an apparition." The name is thought to refer to the practice of harvesting and hanging St. John's wort plants over religious icons on June 24th of every year (St. John's Day) to ward off evil spirits. The second botanical name of the St. John's wort plant, perforatum, refers to the translucent oil glands on each leaf, which look like holes when held up to the light. Gardening. St. John's wort has become a popular ornamental plant, commonly used as a ground cover in amateur gardens and professional landscaping around the world. Skin care. The extract of Hypericum perforatum has antimicrobial, astringent, and emollient properties, which are used in a variety of skin care products, such as moisturizers, lip gloss, body oil, toners, soaps, scrubs, and acne treatments.